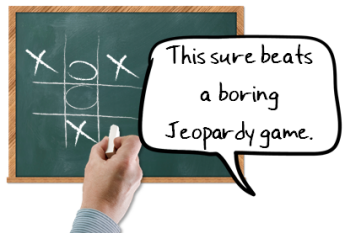 Many of the rapid elearning courses I see use whiteboards or chalkboards. You can buy stock images of these, but it’s easy enough to create them in PowerPoint. So today, I’m going to share a few simple ways to create your own boards. Even if you don’t need to use them, there are some good PowerPoint tips that you could apply to other projects. 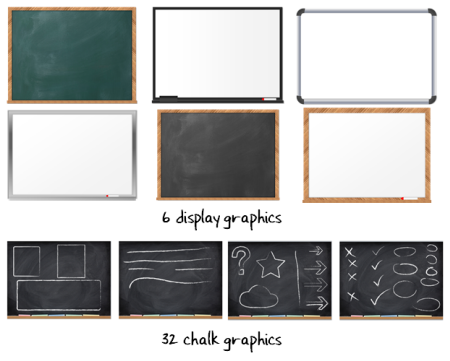 Blackboards and whiteboards are made up of a few key elements. There’s a frame, the board area, and the assets like erasers and markers. If you do a search online you’ll see that whiteboards typically have metal, wood, or black plastic frames. And chalkboards usually have wood frames. These are all easy enough to create in PowerPoint. When creating these, the key is to not get too detailed. Too much detail can get noisy; and means you have to spend a lot more time producing the graphics. Here are a few tutorials on how to create some display boards with a few extra production tips. I’ve also included everything for you to download. How to create a chalkboard graphic. How to create a whiteboard graphic. Use gradient fills as layers to create the marker. How to get more out of the free PowerPoint graphics. How to customize the hand-drawn graphics. Display board graphics: 6 miscellaneous display boards with original PowerPoint files in case you want to make some edits. Chalkboard graphics: 32 miscellaneous chalkboard graphics. Community fonts: 8 great hand-written fonts created by community members. Hand-drawn graphics: miscellaneous graphics from this post. Fonts of interest: here are a couple of fonts that you can download for free from other sites. They’ll work great with the display boards. Be sure to check the license restrictions before using. Hopefully, these free assets come in handy. If you do use them, let me know. I’d like to see what you do. Draw up your image on their HTML5 supported chalkboard. You can then email yourself the image, or snap the page by holding the HOME and SLEEP buttons. Another awesome post! You have incredible ideas. Thank you so much for sharing your talent and skills. You never cease to amaze…so simple, and yet, so interesting looking – rather than those lame built in templates. Thanks so much for all you do for the community. I love this idea! Especially useful in an educational setting. I am thinking of using it with my next teacher in-service day training in January. I think I will show the teachers how to use it for their own classroom. Of course all the credit will be given to you, Tom! Tom – thank you once again. I have been subscribing to this blog for nearly four years now. In that time my graphics skills have gone from being able to manipulate clip-art – to actually creating my own graphics from scratch. I have a number of graphics programmes on my home PC – but I now develop about 90% of my graphics within PP just because I have learnt so much from you. My mind is already spinning with ideas for a key project where I can combine ideas reaised in last week’s hand drawn graphics with this week’s black board tip! The idea of clipping a photo of a blackboard to create my own blackboard graphic – genius! Thank you once again – I wish you, your loved ones and all who read this blog a safe and happy holiday period! Lots of ideas and lots of tips in a single post… Thanks Tom. Thanks again Tom, great stuff! Wow! Both fonts look great. I have saved them to a folder in my hard drive, now how do I use / access them? These are great resources, thank you so much! I’m going to share them with some family members who are educators, and who use PPT a lot. I’m hoping to encourage them and their schools to get an educational license of Studio. What a nice holiday gift, and I’m looking forward to a New Year filled with more Articulate Awesomeness. I appreciate your direct and practical information. It is very practical and better than the courses I have taken. Thanks! Why won’t the Screenr videos play on my computer? @Terry: it’s possible that Screenr is blocked by your site. You can contact IT and see if they’ll whitelist the sie. Some servers block MP4s from streaming. But your IT group should be able to tell. I’m not able to view the Screenr videos, and IT says no… am I able to view them somewhere else??? @Helen: Perhaps you can get your IT to white list the videos if you can show them the value. Many IT groups just block all streaming sites by default. At previous organizations I’d submit a request with our IT for review and I’d get them to unblock the site. I gave you credit at the end of the blog post and at the end of the text below the video. Going forward I will include a shout out to you at the end of the videos.